“It is my pleasure to endorse Jim Freeman for the Idaho Falls City Council. I have known Jim and his family for many years. He served in the fire department when I was the mayor. He not only served well, but showed great leadership skills. He understands the workings of the city and has the kind of personality that allows him to get things done while still being respectful to those who differ in opinion. There are not many families who have contributed so much to the city as the Freeman family. I served side by side with Jim Freeman senior and was acquainted with Russ Freeman and the contributions he made. I am anxious to see another Freeman in a leadership position. 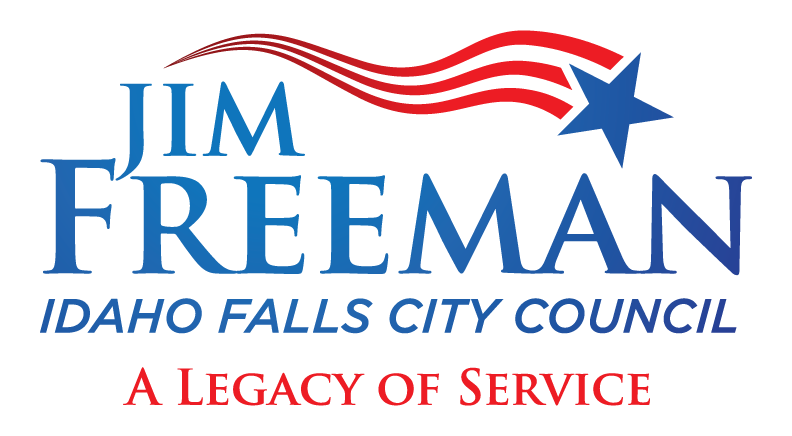 “I am honored to support Jim Freeman for the Idaho Falls City Council. Idaho Falls did not become the city we love today by chance. For decades we have had city leaders with vision and integrity. Jim’s grandfather Russell Freeman, who Freeman Park is named after, was a driving force to create our green belt and reclaim the city landfill and turn it into the beautiful park that we all enjoy today. Jim’s father, Jim Freeman senior, served on the City Council as the Chairman of Parks and Recreation, as well as Chairman of Police and Fire. The Freeman family has a stellar legacy of service to our great city. We need capable leaders with vision to keep Idaho Falls healthy economically, to keep us safe and to keep this a great place to raise our families. “I would like to add my name to the growing list of folks that endorse Jim Freeman for the Idaho Falls City Council. I have known Jim for many years and have had the privilege of working with him on many community projects. Jim is a life-long resident of our city who faithfully serves his community and works to improve our quality of life. Jim’s dedication, integrity and work ethic will make him an excellent City Council member.